There are lots of memorable milestones when you’re expecting a baby. From seeing your baby for the first time on a scan to feeling your first kick. One of the many special moments is announcing the baby’s gender. It is an exciting time where you share with your family and friends whether you’re having a boy or girl. 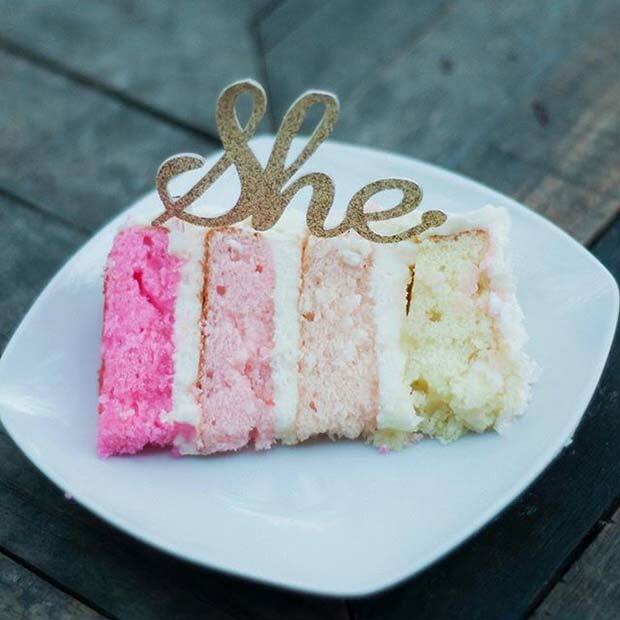 If you’re looking for a cute way to share your big news then check out our 41 creative gender reveal ideas. If you’re looking for something unique then try a baby scan photo like this one. This is a beautiful photo that features cute socks and flowers which are perfect for a little girl. It is an announcement personal to you because no scan picture is the same. You could recreate by using any letters and items and you could add some blue items if your baby is a boy. 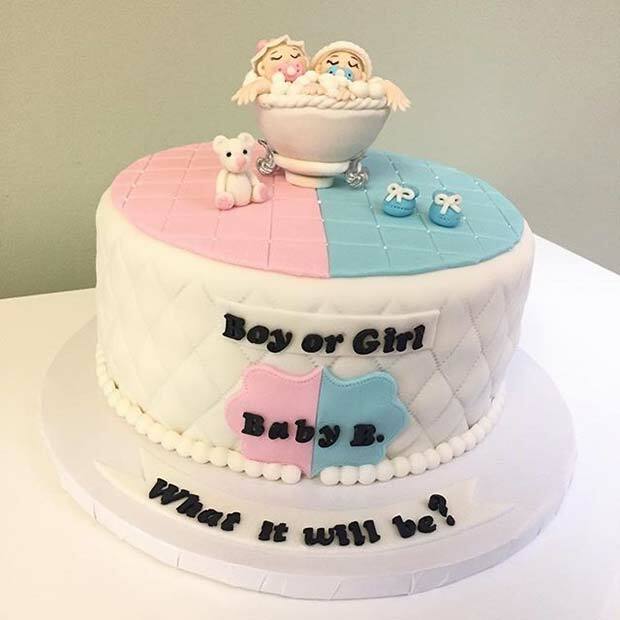 Gender reveal cakes are very popular. Looking at this amazing cake, we can see why. So, a reveal cake features a what will it be design. There are so many to choose from. Then when the cake is cut the gender will be revealed. This can be done with colored sponge or with blue or pink sweets. It is a great idea for a party. To get an idea on how your reveal cake could look like on the inside, take a look at this it’s a girl cake. It features different shades of pink from light to dark. This is cute idea that you could recreate for a party. You could choose just one color and even add some pink sweets. 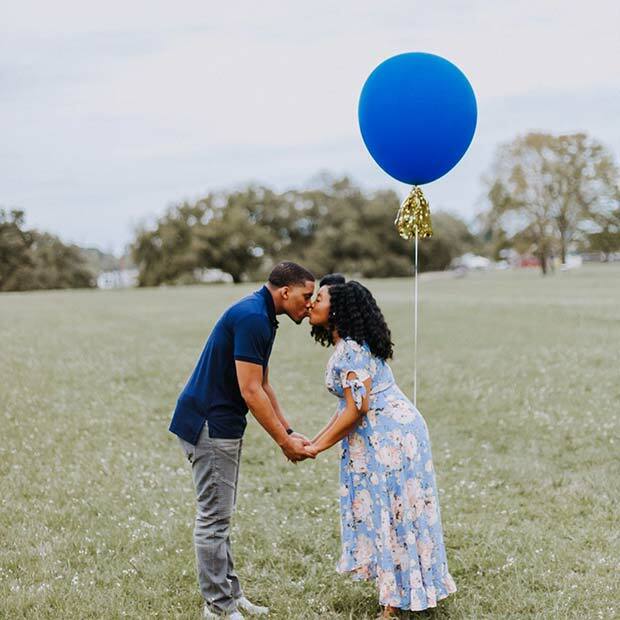 Mystery balloons are a fun way to reveal your baby’s gender. You’ll have a decorated black balloon and inside the balloon will be pink or blue confetti. All you have to do is pop the balloon to reveal the gender. This would be a big hit at a party. If you want to bring some humor to your gender reveal, then consider having your pet in the picture. 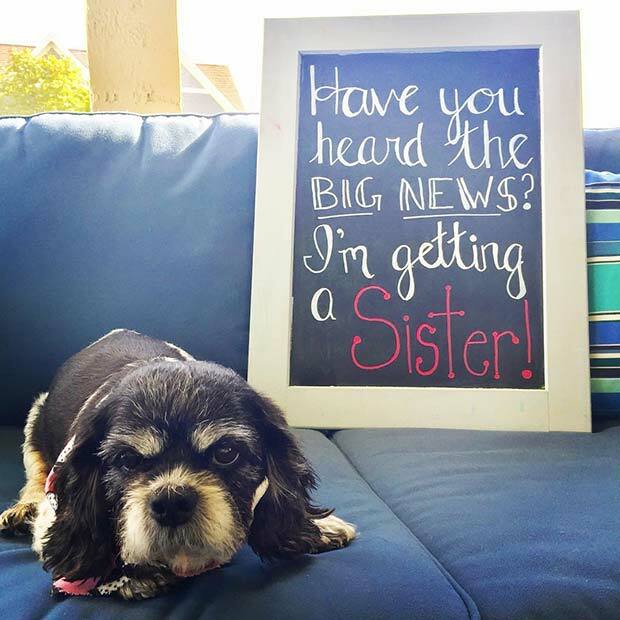 This funny picture shows the parents-to-be are expecting a girl and that their dog is getting a “sister”. The dogs grumpy face makes this a hilarious picture to share with friends and family. 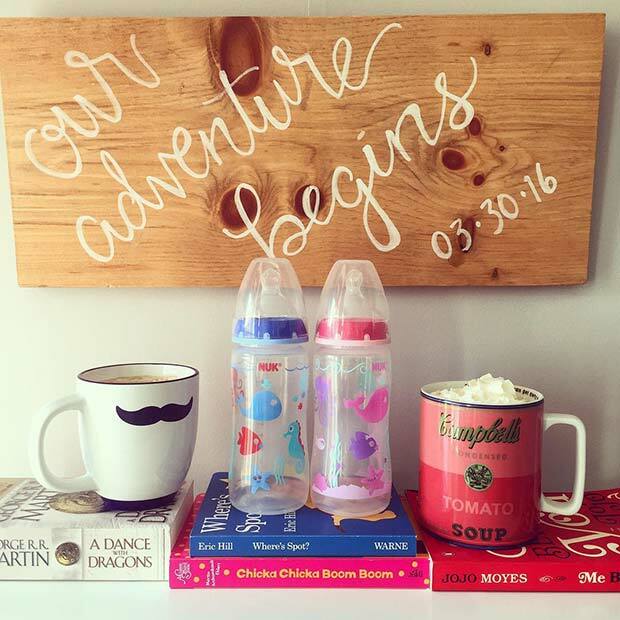 A colored balloon is a simple way to share your baby news. This beautiful picture featuring the parents-to-be has one blue balloon. It is a lovely way to share the moment and will make a great keepsake to remember the special event. 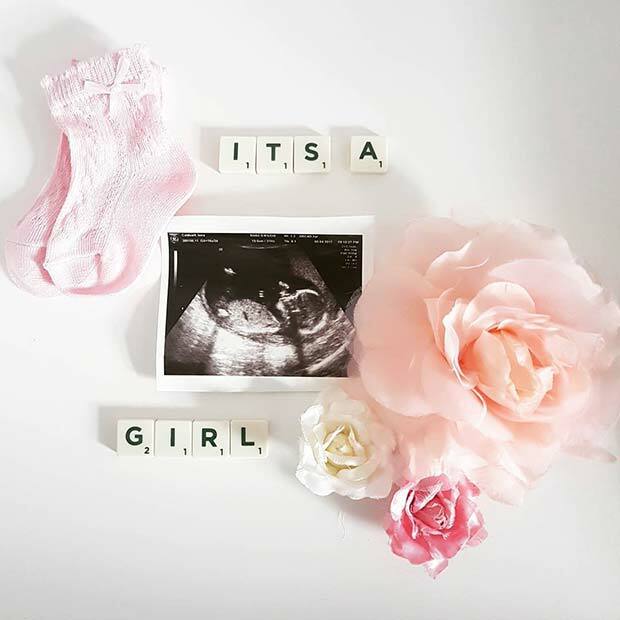 Here is a creative and unique way to share your special news. The black and white photo keeps you guessing. 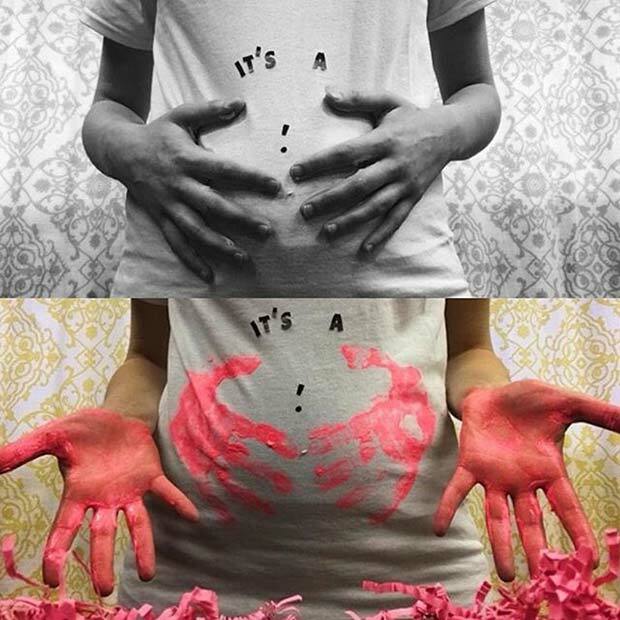 Then the color picture features pink painted hand prints on the baby bump. This makes a very fun picture and can be done in blue paint if you’re having a boy. 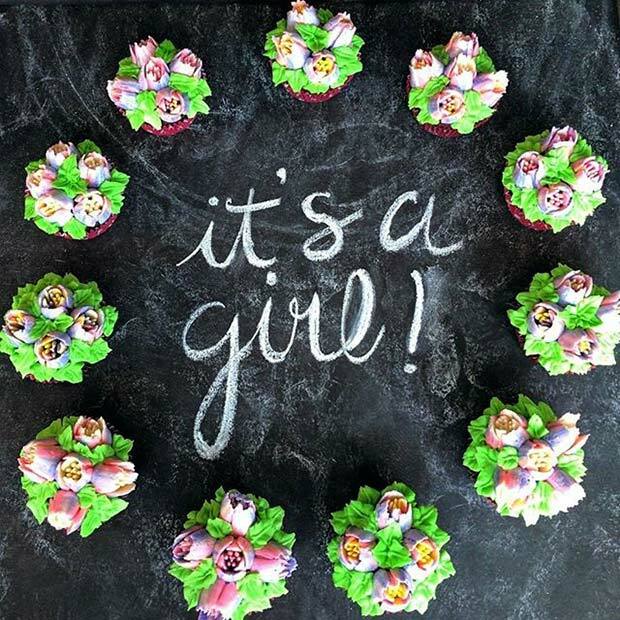 Our next pick shows how cakes can jazz up an it’s a girl sign. The sign features beautiful calligraphy with floral cakes around the edges. Together these make a gorgeous picture to share with family and friends. The cakes could be re-designed to suit a boy. Something like this is simple and can be shared with everyone. You’ve seen an it’s a girl scan picture now it’s time for the boys. 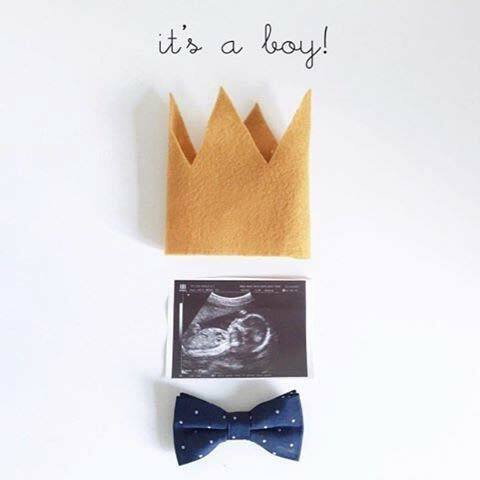 This picture features a crown, bow tie and scan picture. These cute items are perfect for a little boy. It is an adorable picture to share with loved ones. You could add any little items to make it personal to you. Here is one for the parents-to-be expecting twins! 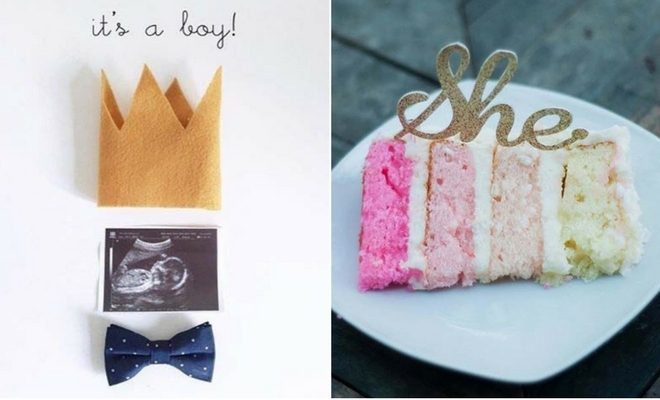 Revealing the gender of twins might require some creativity as you might be having a boy and a girl. Take inspiration from this awesome photo. It features dads mug, mums mug and two baby bottles. One is pink and one is blue revealing that they are expecting both. You could re-create this with anything pink and blue.